Today Bwin.party (this used to be linked to bwinparty.com but they asked me to remove the link) released their 2013 Full Year Result, and I listened to the presentation (this used to be linked the presentation but they asked me to remove the link) by CEO Norbert Teufelberger. There were especially three things in the presentation by Norbert Teufelberger that caught my attention. First I do think it is a good strategic move to focus a lot about mobile, but I would argue that it is even more important to put the players in focus no matter what device they are using. 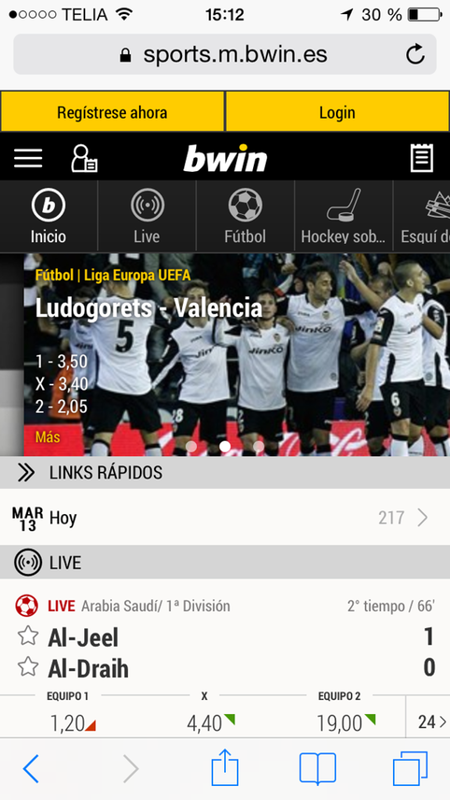 In the presentation Norbert Teufelberger mentioned that they already had launched their new mobile sportsbook in Spain (see image 1), so I of course went to bwin.es (this used to be linked to bwin.es but they asked me to remove the link) to try it out. (at the bottom the start page you can choose English if you do not speak Spanish). Image 1. bwin’s new mobile sportsbook (in portrait mode). This was a real chocker to me. Why would you stop a player to place bets in landscape mode? But then I thought “Hmmm at least it must work in landscape mode on an iPad“. So of course I started Safari on my iPad and went to bwin.es (this used to be linked bwin.es but they asked me to remove the link) to check it out. And I was even more surprised there to see that it do not work in landscape mode there either. So the second interesting quote from Norbert Teufelberger about the site being tested with players and that the tests went really well is very confusing. I have a hard time seeing that any target group analysis would give the design team a requirement saying “It shall not be possible to view the site in landscape mode on a smartphone or a tablet”. The new mobile site looks a lot better than their current one, but I think they need to fix a few things in it. Especially let players be able to choose themselves how they want to use their device when placing bets!